There is also good diving from the beach at the Hotel Foya Branca near the airport. This is organised by Frederick a Frenchman from Paris who speaks perfect english and is very safety conscious. 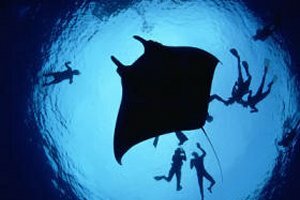 He has a dive centre with fully modern equipment to hire and offers PADI courses. There is also diving from a large catamaran with 8 double cabins operated by Austrians who will take divers on a live-aboard basis for one week at a time. Food is typically Italian/Austrian and is reputed to be good, but we prefer Frederick. Sometimes whales can be heard when diving and occasionally even seen at a modest distance. Atila and Rosario provide PADI& NAUI courses at all levels from scuba diver to dive master, working with their own rib from the containers on Estoril Beach. They are very safety conscious and prefer to take only small groups out when the weather is right. The water is not deep off the beach, so this is a place for shallow diving and watching fish. 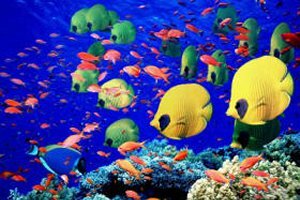 They also gives a variety of courses such as introduction to diving, discover scuba, discover scuba diving and snorkeling trips. They will do night dives and cave dives in the right conditions. Prices are from £25 for a single dive to £250 for a course of open water scuba dives. Dives are limited to five divers at a time. "Leaving Sal, we headed for the north of Santo Antao. Diving here is very different to Sal. The big surf makes getting in and out a little trickier. In the past spearfishing has prevailed, which shows when you try to approach the fish. Unfortunately there hasn't been much diver training either, and some of the local fishermen show obvious signs of the bends. Going underwater for pleasure is sometimes a hard concept to explain. When we showed our lovely hotel manager our underwater photos, she proudly reciprocated by displaying a big bag of dead fish. Eduardo uses a traditional fishing boat for diving, and his crew provided us with a couple of comedy moments. At the end of one dive we tried to return to the anchor line as briefed, but couldn't find it. Just to confuse us, the skipper had moved the boat. 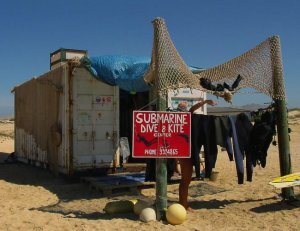 A quirky approach to diver recovery! The first dive from the shore was notable, sadly, for the amount of rubbish lying around. Environmentally there are still things about the islands that may make you cringe. We saw sharks being caught for their fins and, in one place, the octopus population had been savaged following a careless comment from a tourist about the lack of them on the menu. Nevertheless, even so close to the village there was plenty to see. We particularly liked the flying gurnard, a large, peculiar-looking fish with big, colourful wing-like pectoral fins. The next dive was at Selena's Arch, . This is a reef going from 15m to 25m with a host of extremely large cornetfish. One was more than a metre long and stalked us throughout the dive. The archway provided a classic photo op." "Mindelo, the capital of Sao Vicente,is a pleasant, cosmopolitan town with a strong musical tradition. Blue Discovery, run by Frenchman Frederic, is its only dive centre. It's based in a large resort, so we enjoyed lazy surface intervals around the pool. There's always a catch, however, and here it was the huge surf break. The theory is to run like crazy with all your gear on until you get past the pounding waves, quickly put your fins on before you get sucked back onto the beach and then swim calmly to the boat. It doesn't always work, as the person on the next island who finds my fin will no doubt agree. Never mind, the diving was amazing and very close to shore - handy if you have only a 9bhp engine! Our first dive was at Farol, the most common dive-site name on all islands (it means "lighthouse"). 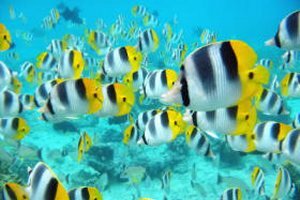 Around the big boulders you could sit and watch the marauding hordes, among them big schools of barracuda, mullet, goatfish and surgeonfish. Hiding in the rocks were tiny sharp-nose puffers, octopuses, morays, spiny lobsters and arrow crabs. Look out for the colourful but painful bristleworms that are rife here. The dive was nicely finished off by the sight of a humpback whale surfacing just 30m from the boat in really shallow water. Cape Verde is a known breeding ground, and two adults and a calf had been sighted several times over the past few days. In lots of places you will see the whales cruising past the shore. The next day, not only did we sight a big school of common dolphins but also a small manta ray on the surface. Mantas and whale sharks are more common in summer, so this was a bonus. . Cape Verde's dive industry is in its infancy, but it will grow. On the other islands, the likelihood of any rescue operation is remote, as there are no helicopters or coastguard.. "